The hottest arms race of 1984 wasn’t between the United States and the Soviet Union, it was Blue Thunder vs. Airwolf. And while history suggests there was a decisive winner in the dogfight between tricked-out TV choppers, getTV viewers have a rare opportunity this week to decide for themselves. Following the success of the Oscar-nominated film, a TV version was developed for ABC with executive producer Roy Huggins, the mastermind behind Maverick, The Fugitive, and The Rockford Files. Meanwhile, Universal‘s TV division – Huggins’ former employer – had their own helicopter series on the tarmac at CBS with veteran writer/producer Donald P. Bellisario. Airwolf was inspired by a third-season episode of Bellisario’s popular Magnum P.I., which frequently featured aerial action courtesy of Magnum’s pilot buddy T.C. (Roger E. Mosley). 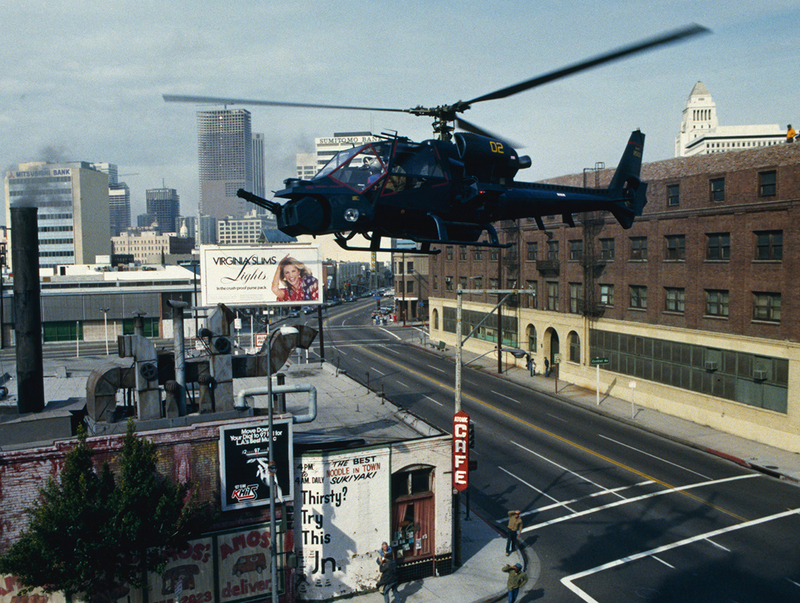 Blue Thunder got airborne first, premiering on January 6, 1984. The titular aircraft – a modified Aérospatiale Gazelle with an AH-64 Apache cockpit – was now piloted by James Farentino, best known to TV audiences as a doctor with a vendetta against Blake Carrington (John Forsythe) on Dynasty. Like Scheider’s character, Farentino’s Frank Chaney was a Viet Nam veteran, but without the crippling PTSD that had been a key element of the film. A pre-Saturday Night Live Dana Carvey was Frank’s co-pilot, also nicknamed JAFO (for Just Another Frustrated Observer, an expurgated version of the police jargon used in the film). Carvey’s mimicry skills were written into the show, with JAFO imitating Jimmy Stewart, John Wayne, Alfred Hitchcock and others, often in the service of a mission. The film version of Blue Thunder was a cautionary tale about the dangers of a militarized police force, with the helicopter essentially cast as the villain and (SPOILER ALERT) killed off at the end by its pilot. The TV show spins that concept 180 degrees, with the aircraft reborn as a mechanized guardian angel. The Orwellian capabilities of Blue Thunder – stealth technology, night vision, infrared thermograph to see through walls, 100x zoom cameras, eavesdropping from a height of two miles – are now used only for good, to thwart a parade of bad guys who just happen to make mischief in the air. And while lip service is given to “getting clearance” for extra-legal activities, that’s not what this show is about. This is science fantasy in the guise of a police procedural: like S.WA.T. in the sky with Dana Carvey doing funny voices. The tonal differences are made clear by the way each version introduces the helicopter. In the movie, Blue Thunder obliterates a mock village at the unveiling ceremony and the demonstration is considered a failure because of its alarming destructive capabilities. The same footage is repurposed for the TV show, and its firepower is applauded. One approach was appropriate for an R-rated film, the other worked for a Friday night action series (where Blue Thunder was counter programming to Dallas, the highest-rated show on television). Viewers who preferred their high-tech yarns with slightly greater narrative complexity found it when Airwolf premiered two weeks after Blue Thunder. In the surprisingly dark pilot episode, Belisario introduces Stringfellow Hawke (Jan-Michael Vincent), a reclusive Viet Nam vet coerced into stealing Airwolf back from its traitorous creator (David Hemmings). With the help of his mentor and co-pilot Dominic Santini (Ernest Borgnine), Hawke retrieves the aircraft and becomes its steward. Hiding Airwolf in a remote desert cave called The Lair, Hawke and Dom work with and against the CIA-style group (shadowy, of course) that developed it, with Michael Coldsmith-Briggs III aka “Archangel” (Alex Cord) acting as liaison. Airwolf had lots of inspirations peppering its storytelling stewpot. The exotic locales were inspired by Bellisario’s recently cancelled World War II adventure series Tales of the Gold Monkey. The British villain/creator in the pilot movie (Hemmings) was borrowed from the Blue Thunder film, which cast Malcolm McDowell as Scheider’s longtime rival. Hawke’s theft of the hero aircraft and his reclusive life in a lakefront cabin are reminiscent of Clint Eastwood’s 1982 Cold War-themed techno-thriller Firefox, as is the show’s reliance on espionage and international intrigue. But what made Airwolf unique in its early days was slowly phased out by the network. By season two, much of the action now took place in the U.S., plots were simplified, and the tone was more family-friendly. Blue Thunder followed an opposite course, moving the story to a Caribbean island to boost ratings that started strong but faltered after an interruption for the Winter Olympics. Ironically, both showrunners – Huggins and Bellisario – left their respective shows due to frustration over network interference. Huggins stepped away after the tenth Blue Thunder episode and went on to produce NBC’s Hunter. Bellisario left Airwolf after the second season and was replaced as executive producer by Bernard L. Kowalski – one of the directors of Blue Thunder. Kowalski’s season three debut as showrunner starred Richard Lynch as an evil genius, playing essentially the same character he had portrayed on Blue Thunder’s first episode. Airwolf rebooted itself with a new cast (and network) for season four, after which it sputtered to a conclusion. Blue Thunder didn’t even get past season one, airing for the final time in September after another interruption for the 1984 Summer Olympics. It was a premature grounding for a show that some of us on the playground thought had a cooler copter, better action, and more entertaining supporting characters (with all due respect to the legendary Ernie Borgnine). Because of its limited number of episodes, Blue Thunder has rarely been rerun since its original broadcast. But 34 years later, it’s finally time for a rematch. On Sunday, April 15, getTV will binge six episodes of the series starting at 12 am ET. Then you can find Airwolf taking off at its regular time Monday through Friday - two back-to-back episodes starting at 2 am ET. Which is better? Watch (or record) them all and compare for yourself! And if you’re really dedicated, spend this Saturday searching for your old Airwolf and Blue Thunder toys in your parents’ attic. If you can’t find them, you can borrow mine. The Blue Thunder 6 episode binge starts Sunday, April 15 at 12 am ET/9 pm PT. Airwolf airs weeknights with 2 back-to-back episodes starting at 2 am ET. For more info, visit the getTV schedule.